Many experts expect interest rates to rise later this year or early next year, but many have been wrongly predicting this for some time. As a baseline, with an interest rate of 3.77 percent, only 20 of 582 county housing markets (3 percent) were unaffordable by historic standards in the first quarter of 2015. At the end of the day, interest rates are one of three levers that affect home affordability along with income and home prices. Many experts expect interest rates to rise later this year or early next year. Although the experts have been wrongly predicting rising interest rates for some time, and there is a compelling argument that interest rates could even go negative, RealtyTrac thought it prudent to run some scenarios on the impact on housing should the experts be right this time. The interactive heat map below shows the results of the analysis, and below the heat map are some high-level findings in bullets along with a more detailed explanation of the methodology behind the analysis. Simply move the slider at the top of the heat map to see which local markets become unaffordable (turn from blue red) based on interest rates rising to four different milestones: 4 percent, 4.25 percent, 4.5 percent and 5 percent. The baseline interest rate of 3.77 percent is based on the average interest rate as of the first quarter of 2015. Click on any specific county to see the full affordability details for that county. 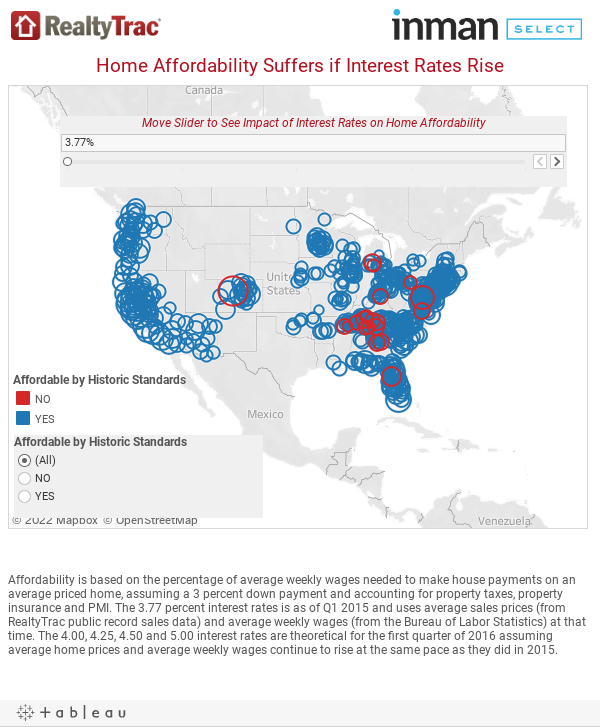 If interest rates rise to 4 percent in the first quarter of 2016 (and home prices and wages continue to grow at the same pace as they did in 2015), 76 of the 582 counties (13 percent) would be unaffordable by historic standards. If interest rates rise to 4.25 percent, 91 county housing markets (16 percent) would be unaffordable by historic standards. If interest rates rise to 4.5 percent, 111 county housing markets (19 percent) would be unaffordable by historic standards. If interest rates rise to 5 percent, 152 county housing markets (26 percent) would be unaffordable by historic standards. Interest rates are one of three levers that affect affordability along with income and home prices. This affordability analysis assumes home price appreciation and wage growth will continue at the same pace it was at in the first quarter of 2015 in the first quarter of 2016. Affordability for this analysis is the percent of average weekly wages needed to make monthly house payments — including property taxes, home insurance and private mortgage insurance — on an averaged-priced home for a buyer putting 3 percent down. A market was considered unaffordable if the affordability percentage was above its historic average over the past 10 years for that particular county.